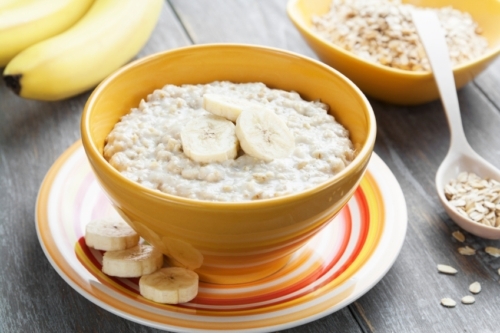 Home » Food and Nutrition » Does Oatmeal Lower Blood Pressure? Does Oatmeal Lower Blood Pressure? People always ask me: Does oatmeal lower blood pressure? You may have heard of the blood pressure banana, but now it’s oatmeal’s turn in the spotlight as a food that can lower high blood pressure. On the surface, oatmeal may seem like an odd candidate to have blood pressure lowering effects. After all, oatmeal is mostly known for its fiber content, and fiber doesn’t get absorbed by the body. How could something that doesn’t reach the blood affect blood pressure? Much of the excitement about oatmeal being a food that can lower blood pressure comes from a 2002 study that used 18 hypertensive men and women and divided them into randomized, controlled groups. The control group ate less than one gram per day of fiber from cereal and the study group ate 5.52 grams of fiber from whole oat cereal each day for six weeks. The control group showed no observable change in blood pressure but the study group had a 7.5 mm Hg reduction in systolic blood pressure and a 5.5 mm Hg reduction in diastolic blood pressure. This is not an insignificant result and although the small sample size makes it tricky to generalize, the stark difference between the control and study groups strongly suggest that oatmeal can lower blood pressure. How Does Oatmeal Lower Blood Pressure? Although fiber is most known for helping you have a bowel movement—that is not its only role. Fiber comes in two types, soluble and insoluble, which indicates whether it dissolves in water or not. Oatmeal contains beta-glucan, a form of soluble fiber. When it breaks down in the watery environment of the digestive tract, beta-glucan forms a sort of gel that, among other things, can absorb LDL cholesterol and carry it out of the body. LDL cholesterol is also known as the “bad” kind of cholesterol. It’s the one that can form deposits on the arteries and harden into plaques capable of narrowing the blood vessel and forcing the heart to work more to pump properly. This effect raises blood pressure, which can damage the arteries even further. If less LDL makes it out of the digestive tract, then there’s less potential for plaque, which means lower blood pressure. It doesn’t hurt that oats are also a good source of potassium, magnesium, calcium, zinc, B-vitamins, and vitamin E, all of which are important for cardiovascular health. It’s worth noting that the science only shows oatmeal as being able to lower blood pressure in people who are already hypertensive. If you aren’t hypertensive and don’t eat an LDL-rich diet, you aren’t as likely to see an impact. How Much Oatmeal Is Safe to Consume? Oat products in Europe and the United States are allowed to claim that they reduce cholesterol or blood pressure if they can provide at least three grams of beta-glucans per day. One hundred grams of oats contains about five grams of beta-glucan, slightly less than the amount eaten in the 2002 study. It will take about 60 grams of oats per day (about two-thirds of a cup) to get the three grams considered the minimum for a health claim. Generally speaking, a cup or bowl of oats per day is a good goal to aim for. The easiest way to get some oatmeal in your diet to lower blood pressure is to have a bowl of oats or oatmeal in the morning or before any intense physical activity. This serves two main purposes. The first is, obviously, that you get a solid meal and the day’s dose of beta-glucan. The second is that oats are digested more slowly by your body than other foods. This means that its nutrients are absorbed at a steadier pace and can keep you supplied with energy for longer periods. This is why athletes tend to eat oats when in training as a way to preserve stamina. 1. Toast the sesame seeds over medium heat. It’s important to shake the pan periodically since the seeds will “jump” like popping popcorn if allowed to stay still for too long. Set aside. 2. Form the oatmeal into meatball-sized balls and dip in the shredded cheese until covered. Dunk the ball in the toasted sesame seeds. 3. Cook the balls over high heat on a skillet for about 10 minutes per side. Flatten them with a spatula as they cook. The coating should get crispy. 4. Optionally, sprinkle fritters with a little sea salt or top with a poached egg. 5. Serve with the sauce of your choosing. Oatmeal is far from the only food that can lower pressure. Try adding one or more of these to your diet. Bananas: Bananas are high in potassium, containing about 10% of your daily amount. Potassium is used by your kidneys to balance out your body’s sodium levels and remove excess fluid. Too much fluid can raise blood pressure, so if you have a high sodium diet, consider tossing some banana slices onto your oatmeal. Cinnamon: No one actually knows why cinnamon can lower blood pressure, but the effect is known to be stronger in diabetics so it’s assumed that it has something to do with how cinnamon influences insulin or blood sugar levels. In any case, adding as little as half a teaspoon to your oatmeal can be another way to lower blood pressure. Sweet potatoes: These aren’t exactly oatmeal-compatible, but sweet potatoes actually have more potassium in them than bananas. For dinner or lunch, consider roasted slices, fries, or even a tasty mash. Regular potatoes: Normal potatoes have antioxidants which are known to reduce inflammation. If you’re low, adding a few Idaho potatoes to your diet could help keep your body in balance and bring down any inflammation that could be swelling arteries. So does oatmeal lower blood pressure? Well, as expressed above, science shows oatmeal as being able to lower blood pressure in people who are already hypertensive. If you aren’t hypertensive and don’t eat an LDL-rich diet, you aren’t as likely to see an impact. Keenan, J.M., et al, “Oat Ingestion Reduces Systolic and Diastolic Blood Pressure in Patients with Mild or Borderline Hypertension: A Pilot Trial,” The Journal of Family Practice, 2002; http://www.jfponline.com/?id=21643&tx_ttnews[tt_news]=178408&cHash=e1b1e9a0473ce64709eff1760bfbe91d. Barron, B., “How Does Cinnamon Reduce Blood Pressure?” Livestrong web site, August 16, 2013; http://www.livestrong.com/article/27611-cinnamon-reduce-blood-pressure/, last accessed March 8, 2016. Haiken, M., “7 Foods That Lower Your Blood Pressure,” Forbes web site, October 23, 2012; http://www.forbes.com/sites/melaniehaiken/2012/10/23/7-foods-that-lower-your-blood-pressure/#706cd3a526d0, last accessed March 8, 2016. “Can Oatmeal Help Lower High Blood Pressure?” High Blood Pressure Be Gone web site, 2013; http://highbloodpressurebegone.com/can-oatmeal-help-lower-high-blood-pressure/, last accessed March 8, 2016.
Zimmer, E., “Sesame-Crusted Oat Fritters with Chimichurri Dipping Sauce,” Serious Eats web site, February 19, 2009; http://www.seriouseats.com/recipes/2009/02/sesame-seed-crusted-oat-fritters-with-chimichurri-sauce-recipe.html, last accessed March 8, 2016.